Southeast Michigan's Liberty Snapping Turtles and and captured the Midwest Championships for the third consecutive year! * The 14 & U Int. Chippewa Servers were also crowned Midwest Champions and have earned a spot at the JTT National Championships this October in South Carolina. Wrapping up another great season! 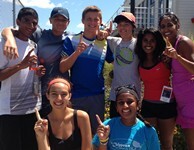 Thanks to all JTT participants district-wide, we look forward to another great season for 2013-14 starting in October!